The men who kept track of all of the trains moving across a division on a railroad were the dispatchers. Each of them worked an eight-hour shift, or “trick.” These so-called trick dispatchers then reported to the chief dispatcher who was known to all as the “chief.” The chief depended on his team of dispatchers to keep order over all the trains operating on their division, and consequently they depended on the chief to help get them out of a jam when problems arose. Everyone in the dispatcher’s office depended on the train crews. It was their responsibility to keep each train rolling across the division. Everyone did their best to stay on schedule, but that could prove quite difficult without the help of a third group of “hidden” railroaders who were absolutely essential to the entire operation: the “Tower Men.” These railroad workers manned the control towers located at busy railroad crossings and junctions. Each was in effect the “traffic cop” who signaled to the trains which of them could proceed through the railroad intersection and which of them had to wait their turn at these busy junction points. They also provided the muscle that physically moved the levers that aligned the track switches and changed the signals from red to green. Technically speaking an interlocking complex (or interlocking plant) is a series of mechanical devices that must be operated in a predetermined sequential order to line up track switches and signals to allow one or more trains to safely pass through the interlocked area of tracks. This is precisely what an interlocking does—on any railroad—whether it is mechanically or electrically operated, locally manned or remotely controlled. Because Central Avenue had so many tracks and connecting lines, a 40-lever Union Switch and Signal Company interlocker was required. This was a large, complex machine that weighed several tons. The interlocker was contained inside of a tall, 2-story, wooden structure known as the interlocking tower. It’s the tower in which the tower men worked and it really was the heart of Central Avenue on the railroad. 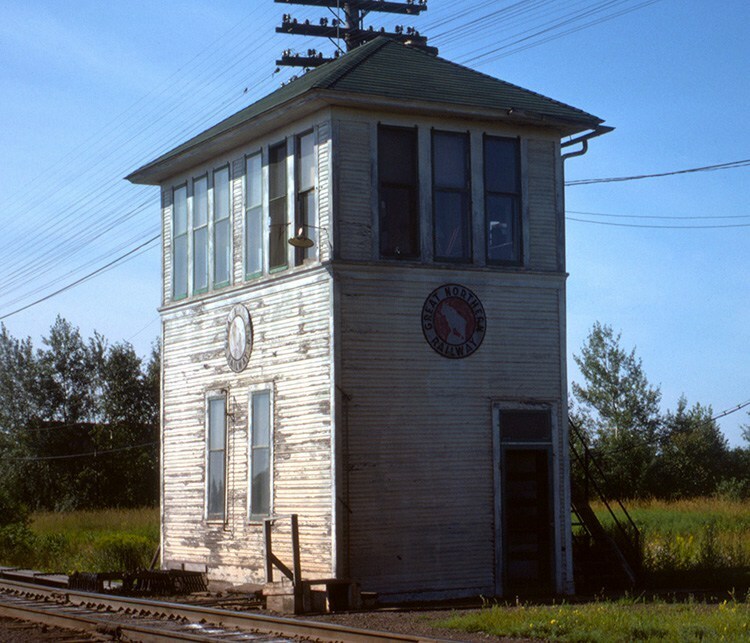 In fact, many early communities depended on these kinds of towers to serve as temporary depots for freight and passengers. Some were even used as a community’s first city hall because they were often the first permanent structures with heat, light, and a communication system. In actual operation, the interlocker was a mechanical device that operated track switches and signals that allowed trains to move safely through the plant without colliding. 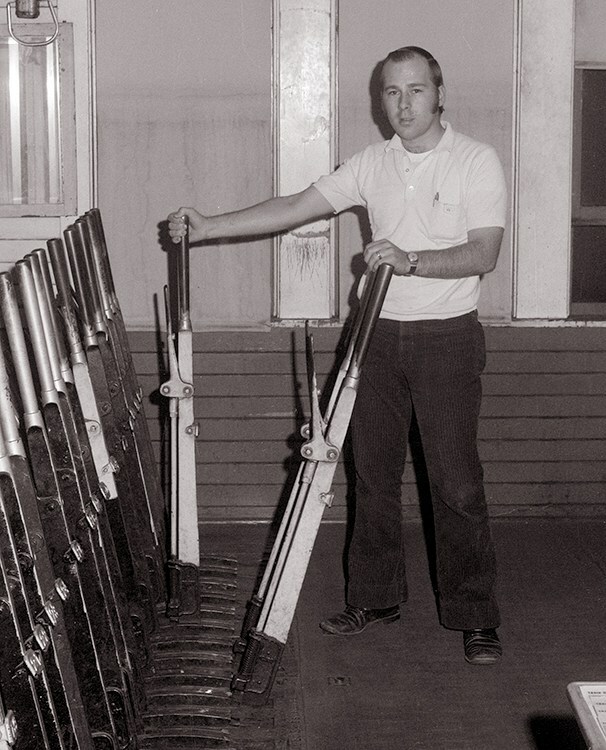 These track switches and signals were moved mechanically by hand-throwing long steel levers located within the tower’s top floor. When the levers were thrown, that mechanical motion was transferred outside of the tower and sent along dozens of steel rods mounted on rollers in close proximity to the ground. The rods were hollow to keep them as light as possible. Some rods even traveled underneath the tracks to get to distant parts of the plant. Bell cranks were used when the linear motion needed to go left, right, up or down. Some of the switches being thrown were hundreds of feet from the tower. A large man with some weight on him could do the job fairly easily. But it did require significant strength to throw the purely mechanical levers. Many tower men called them “Armstrong” levers because you needed strong arms to do it. This was especially true in winter months when ice and snow would build up on potentially thousands of linear feet of steel piping. As the tower building was a manned control point, it allowed the operator to route trains properly. It also simultaneously prevented accidental collisions. Here’s how. Working high above ground level the operator could easily see what was coming down the tracks through any of the many windows that surrounded his working stage. The levers were arranged in numerical order and each corresponded to a particular switch and signal along the tracks. The more routes that were available through the interlocking, the more different combinations of levers would need to be thrown to create those different routes. Each tower had a large chart on the wall above the levers so that it was easy to determine the route. Each possible route was assigned a multi-letter combination (e.g., A-B, C-D, or J-F, etc.) known only to the tower man. A series of numbers assigned to that letter combination then determined exactly which levers needed to be thrown and the exact order in which to throw them. Simple routes required the throwing of just two or three levers. Most were five or six. The most-complicated routes required 10. Tower men had many duties but if they were generally fit and could match numbers on a chart with numbers on the levers, then they could certainly handle this particular part of the job. Before these mechanical interlocking plants were used, switchmen working on the ground scurried about throwing switches to line up trains. But that was fraught with danger and, too often, disaster. Human error played a part in many significant train crashes during those times, especially at busy junctions. The inherent safety of the interlocking plant provides that once a route has been established by the tower operator—and the oncoming train was in close proximity to the tower—the track route could not be changed again until after the entire train went completely through and past the interlocking limits. The limits were determined by the group of outer opposing signals of the interlocking with everything in between those outer signals considered part of the interlocking. This complex of tracks, switches, and signals was controlled by authority of the tower operator alone in conjunction with standard rules and practices that he followed. 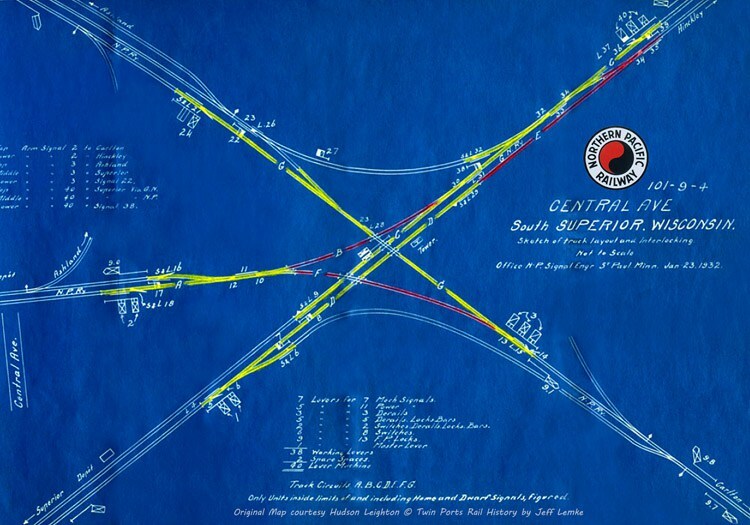 With so many potential track routes through a railway junction point, a system of interlocked mechanical appliances had to be developed to increase safety on the rails. This new system prevented human error from routing two trains onto the same track at the same time. It also prevented the man at the levers from accidentally changing a route at the last moment. The track switches, switch locks, signals, and timers were all interconnected. Once a route had been established for train A, no part of that route could be accidentally given to or intersected by trains B or C because the levers and switches were temporarily mechanically frozen in place. Each train’s route was exclusive to that train and couldn’t be changed until after the train had completely passed through the limits of the interlocking. Even with all these controls in place it was still possible for an operator to make a mistake. He could accidentally line up a train improperly before it got too close. In that instance the approaching train would have to be stopped by signal or radio communication before it reached the plant. Then one or more electro-mechanical timers would have to be set and time allowed to run down before a line-up change could be made without the train first passing through the plant. This time penalty kept the train safely in one place while the operator made up his mind once and for all about where this train really needed to go. It kind of gave the operator time to think about his sins that day. The time wasn’t long, usually three to five minutes at most. But when trains needed to be kept moving the operator’s train delay report eventually ended up on his boss’s desk, and that could spell trouble. When operators made minor blunders like this it simply created potential train delays. Often the mistakes were corrected long before the train made its appearance and no one was the wiser. But surely there was a time when train delays meant angry customers, lost business, and seething bosses. These things were to be avoided whenever possible. And if all of this wasn’t enough to do, operators working inside of the towers had other important duties, including managing the train order signal. While the dispatchers were in charge of all trains on the line, it was the station agent or tower operator who took delivery of orders from the dispatcher and passed on his precise written orders directly to on-train personnel.